Much of our research at Loveland Products focuses on understanding the true benefits of a single product for a grower. We evaluate crop protection products, adjuvants, plant nutrition products and technology products such as plant growth hormones and fertilizer catalysts. Once we have identified individual products that have proven to be highly consistent in their performance, we might look at them as part of a program approach by combining products in one application or considering multiple products as sequential applications to provide synergy or additive benefits to crop production. One of these synergistic combinations is Accomplish LM (used with liquid applications) and Titan PBA (used with dry fertilizers), two biochemical products that can be incorporated into a grower’s fertility program to improve nutrient availability and uptake. 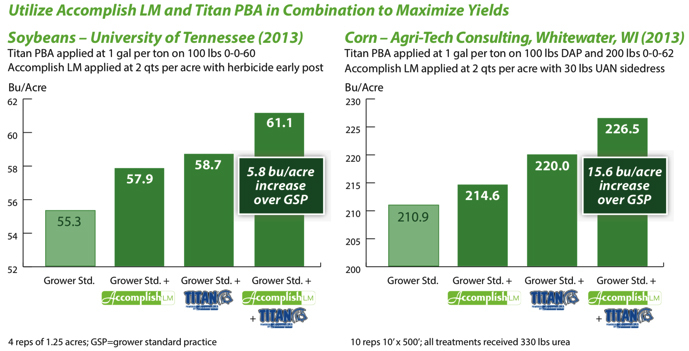 We are often asked, “Which is the better biochemical application: Accomplish LM or Titan PBA?” I can tell you that—while both individual products perform very well in the field and offer great returns for growers—our research indicates that the right answer is to use both products in the same crop cycle. The reason lies in how the unique mode of action works in these different applications. Applying Titan PBA to dry fertilizer allows us to get a highly concentrated amount of biochemistry directly onto the applied fertilizer. This increases the first-year availability of the applied nutrients. By following this with a spring application of Accomplish LM (broadcast or banded), we not only get increased root growth, we also get better release of nutrients that are already present in the soil. Overall, the combination of Titan PBA and Accomplish LM gives us a tremendous increase in the availability of applied nutrients and in the availability of the underlying nutrients already in the soil. Combining this with an increase in overall root structure creates a powerful synergy between greater nutrient availability and a greater ability for the plant to take up nutrition. Research shows that when it comes to Titan PBA and Accomplish LM, unleashing the Power of Two really is the right answer.